ink - le challenge - a vintage elf and flowery goodness! It's been a crazy busy month and despite lots of ideas for the ink theme I left it until the last minute again!! 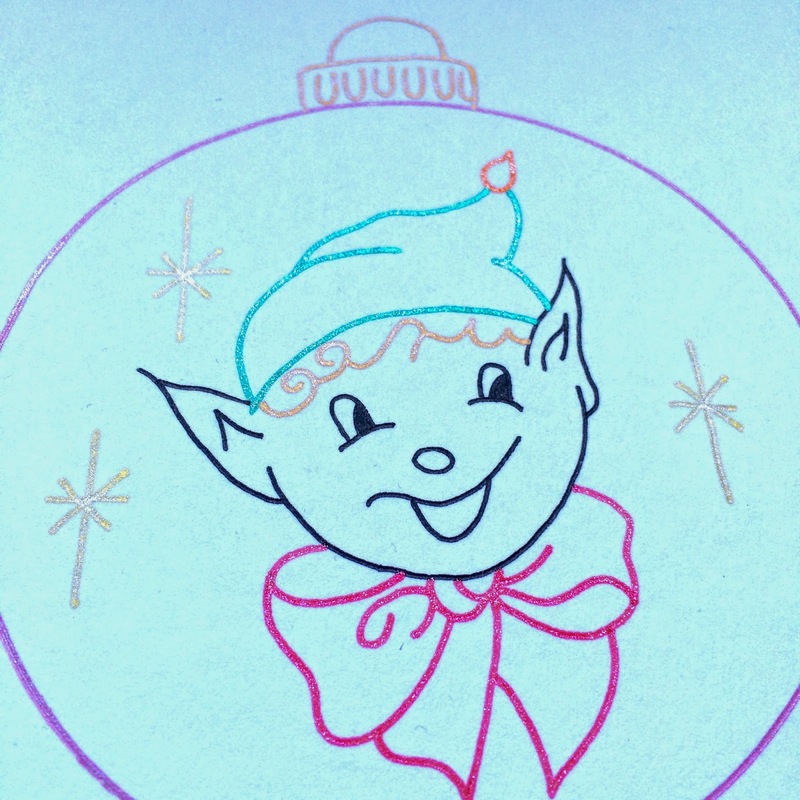 I came across a cute vintage elf embroidery pattern on pinterest, it was credited to Crafty Modern but despite lots of googling I can't find the original pattern so that's as much info as I can give. Here's a weird lighting shot so you can better see the glitteryness! I think it makes a cute festive card! If you've made anything using ink, with the colour ink or that relates to the theme 'ink' in any way you can link up your finished project now at le challenge for a chance to win a $25 gift certificate to the Fat Quarter Shop! from left to right: Floral Bouquet in Blue, Old New 30s by Atsuko Matsuyama; Cherries in White and Red, Old New 30s by Atsuko Matsuyama; Daisy Grid in Gray, Suzuko Koseki for Yuwa; Cottagely Posy in Teal, Priory Square by Katy Jones and Aurifil 50wt #2600 - my favourite colour for hand piecing. Such a charming little Elf, I'd love to embroider him. Nice to hear your daughter shares her lovely pens! Great stashing too. Who doesn't like gliterry pens! I'm still unsure what to make, lol. Fun wee guy, and glittery pens are fab! I did a lot of calligraphy when I was younger, but haven't touched a pen in years, perhaps I need to break them out. When I have a spare moment. Whenever that may be.. I 'helped' my 5 yr old Granddaughter make a quilt for her other Granny who has dementia. It was a simple 9 patch but before layering it up we taped the backing fabric onto a plastic covered table and she drew pictures and wrote messages with fabric pens .After I had heat set the ink and it was layered, 'we' quilted it and she gave it to he Granny for her birthday. She has since made a quilted pillow for Fathers Day and a T shirt for her brother using fabric pens. Gorgeous.I love use gliterry pens to write xmas cards.Have a fun week! you know i have a thing for florals! they are all great but the red and white is probably my favorite. what a cute little elf - it's a great card! Such a lovely idea for a special touch. I find it hard to find cards I really love, and I only send about 15 every year, so making them would not be too time consuming. Although I should probably start in March. That little pixie is so cute!! What a fun design for a card, and anything with glitter is briiliant in my books. I love your florals, The postie just brought me a layer cake of Gardenvale! Such a super cute pixie! And lovely new fabrics - I am still waiting for my Black Friday purchases to arrive! That's so cute, Lucy! How does Le Challenge work? I saw Deborah's bag and it inspired me to make something "ink" themed too. Is there a page about the challenge somewhere? The card is so cute! Never thought of making one like this, I love it! He's so cute and he's mine! Thank you!